Image size from 60" to 130"
Physical attributes. All connectors are on the side of the AW4001 closest to the screen, which we'll call the front. With the projector on a table, the ports are near the top and the power connector is near the bottom, just right of center as seen from the front. The security bar is at the bottom edge of the front, near the left side and just to the right of the Kensington lock slot. The intake vent is on the left side panel as viewed from the front. Exhaust vents cover nearly the entire right side panel, with an additional vent on the left side and one on the back. The window that serves for a lens is on top in a recessed notch near the rear of the projector. The speaker is on the front, facing away from the seating area. Low Brightness Mode. Compared with Normal mode, Long Life 1 measured 77% as bright. Both Long Life 2 and Whisper modes measured 51% as bright. In addition, you can set the power level from 50 to 100 in increments of 1. At 50 the brightness is the same as for Long Life 2. At 75, it matches Long Life 1. The power modes also affect the light-source life. Hitachi rates Normal and Whisper at 20,000 hours, Long Life 1 at 30,000 hours, and Long Life 2 at an astounding 50,000 hours. Presentation Optimized Lumens. The best balance of brightness and color accuracy for business presentations requires adjustments to Gamma and Color Temp settings, which are available only in the three User modes. With optimized settings for presentations, the test unit measured 3,097 lumens — enough to light up even a 1.0-gain 16:10 screen in moderately bright ambient light at Hitachi's recommend maximum 130" diagonal image size. For brighter rooms, all of the color presets deliver more than acceptable color with default settings. As with most projectors' brightest modes, Dynamic has a green bias. But it is so slight that it showed only in one photo we use for testing precisely because it shows a green bias easily. Colors are a touch lacking in saturation, which can give them a pastel look. However, they are vibrant and attractive overall, making Dynamic highly usable when its high brightness is required. Standard and Whiteboard modes are similar to Dynamic, with colors a little more saturated. Cinema is a little red shifted. Natural delivers nicely saturated color, but at lower brightness than our optimized settings. Video Optimized Lumens. The optimized settings for video and film also requires tuning Gamma and Color Temp, primarily for still more accurate color. The measured 2,210 lumens is bright enough in moderately bright ambient light for a 120" image using a 1.0-gain screen or a 130" image using a 1.2-gain screen. Brightness Uniformity. Maintaining uniform brightness across the entire image is a challenge for ultra short throw optics systems. The AW4001 test sample handled the challenge well, scoring a measured 77%. With a 100% white test image, a close look shows that the left and right edges are a touch dimmer than the broad center swath, but there are no obvious hot spots or dim areas. The change is gradual enough so it is impossible to see with text, graphics, or photorealistic images breaking up the field of view. Input Lag. The input lag varies from 48 ms to 50 ms for all modes but Whiteboard, which is 54 ms. Even 48 ms is a little slow for applications like flight simulators where real-time reaction is critical. But it is fast enough for any educational interactive application where input lag might matter. On-board audio. The 16-watt mono speaker delivers good audio quality at high enough volume for a mid-size room. Fan noise. 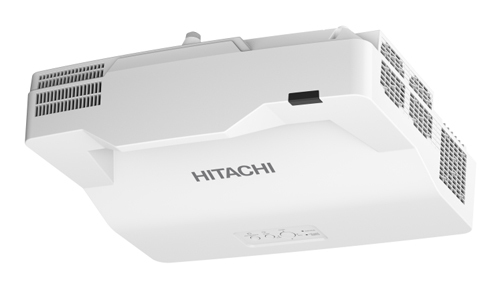 Hitachi rates the AW4001's noise level in Normal power mode at 34 dB to 28 dB, depending on the power setting. Ratings for Long Life 1 and 2 are also 34 dB. The Whisper mode rating is 28 dB. Even at the higher level, the steady hum fades into the background, particularly in a room with ambient noise. In Whisper mode, it all but disappears. There is no High Altitude mode. Lens offest and mounting. The AW4001's lens offset is designed for placing the projector on a table below the screen or on a wall mount above it. With the projector on a table, the bottom line of the image is a little less than 20% of the image height above the centerline of the window that serves as a lens. Keep in mind that the window itself is in a recessed notch near the back, and the offset is from the window, not from the highest point on the projector. Unlike most UST projectors, the AW4001 offers motorized focus, so you can stand where you can see the whole image while focusing. If the projector needs to tilt or swivel to point at the screen, you can adjust both vertical and horizontal keystone by +/- 5%. Additional controls include both four-corner and V/H pincushion and barrel distortion correction for projecting on uneven or curved surfaces. You can also shrink the image with digital zoom and then digitally move it up, down, left or right. However, digital zoom and geometry controls are best avoided. Using them means not taking advantage of the entire imaging chip, which lowers brightness and can introduce artifacts. Throw Distance. 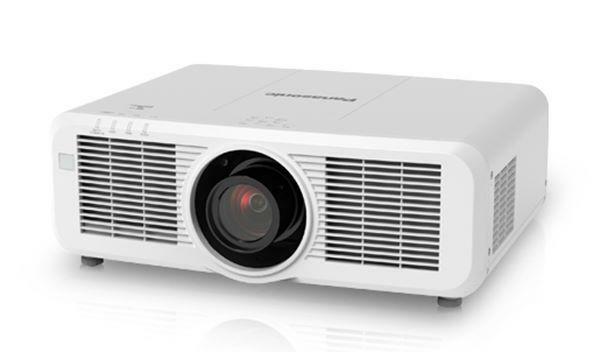 The AW4001 has no optical zoom, so to match the image size to the screen without using digital zoom, you have to position the projector properly. The throw distance between the screen and the window that serves as a lens is 1' 4" for a 60" image to just short of 3' for a 130" image. If you venture much beyond that range, it is impossible to focus the entire image. 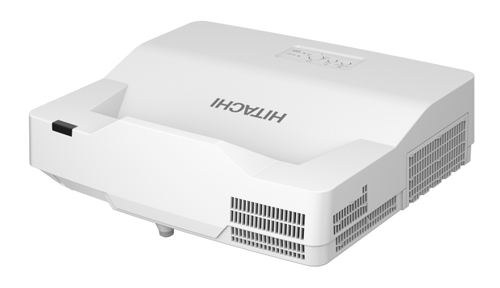 The Hitachi LP-AW4001 Projection Calculator will give you the throw distance range for the image size you want in terms of the window near the back of the projector. Subtract 12.5" from that number to get the distance between the front of the projector and the screen. 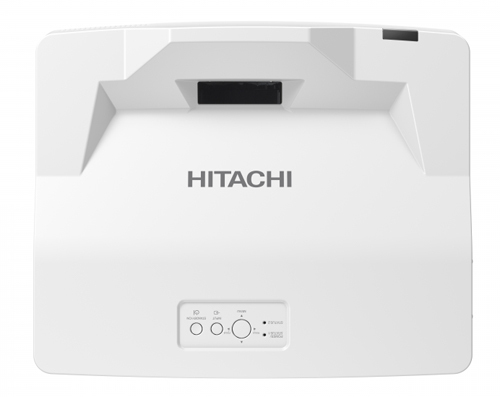 The Hitachi LP-AW4001 delivers solid image quality, high brightness, and an aggressively low price. At $2,349 street, it is--at this writing--the least expensive laser-based, UST projector in its brightness and resolution class. It also offers unusually painless setup. At 16.8 pounds it is easy to handle, and its convenience features--most notably motorized focus and geometry correction--are highly welcome. The test unit slightly bettered its 4,200 ANSI lumen rating at a measured 4,231 ANSI lumens. It can also be set to as low as 1,033 Lumens, and to almost any level in between with some combination of color preset mode and custom power setting. Budget-sensitive users will appreciate that they can save on electricity by using just the brightness they need for the screen size and lighting conditions. Even the 2,210 lumens for our optimized video settings can light up a 120" 1.0-gain screen or a 130" 1.2-gain screen in moderately bright ambient light. The Hitachi LP-AW4001 easily qualifies for our Road Test Certified award. Its combination of high brightness, ultra short throw, laser-phosphor light source, ease of setup, and little-to-no maintenance makes it a strong contender for classrooms and conference rooms as well as for signage and displays. The aggressively low price makes it a solid value as well, and should earn it a place on your short list.